He’s been a bad, bad rake – and it takes a governess to teach him a lesson. Like any self-respecting libertine, Chase lives by one rule: no attachments. 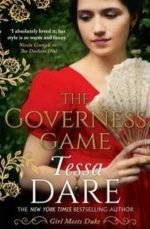 So when a stubborn little governess tries to reform him, he decides to give her an education—in pleasure. That should prove he can’t be tamed. But Alexandra is more than he bargained for: clever, perceptive, passionate. She refuses to see him as a lost cause. Soon the walls around Chase’s heart are crumbling… and he’s in danger of falling, hard. Alexandra Mountbatten had common sense. That’s what her friends believed. The truth was, Alex had no sense at all—at least, not when it came to charming gentlemen with roguish green eyes. If she possessed any wisp of rationality, she wouldn’t have made such a fool of herself with the Bookshop Rake. Even now, more than half a year later, she could revisit the embarrassing scene and watch it unfolding, as though she were attending a play. The date: a Wednesday afternoon in November. The personages: Alexandra, of course. Her three closest friends: Nicola Teague, Lady Penelope Campion, and Emma Pembrooke, the Duchess of Ashbury. And, making his first appearance in a starring role (trumpet fanfare, please)—the Bookshop Rake. Alexandra had been juggling a tower of Nicola’s books in one arm and reading her own book with her free hand. A copy of Messier’s Catalogue of Star Clusters and Nebulae, which she’d plucked like a pearl from the used-book section. She’d been searching for a secondhand copy for ages. She couldn’t afford to buy it new. One moment, she’d been blissfully paging through descriptions of astronomical nebulae, and the next . . .
Bang. A collision of cosmic proportions. The cause remained unclear. Perhaps she’d taken a step in reverse, or maybe he’d turned without looking. It didn’t matter. Whosoever’s elbow jostled the other’s arm, the laws of physics demanded an equal and opposite reaction. From there, the rest was gravity. All her books fell to the floor, and when she looked up from the heap—there he was. Ruffled brown hair, fashionable attire, cologne that smelled like bottled sin—and a smile no doubt honed from boyhood as a means to make women forgive him anything. With affable charm, he’d gathered up the books. She’d been no help at all. He’d inquired after her name; she’d stammered. He’d asked her to recommend a book—a gift, he said, for two young girls. In response, she’d stammered yet more. He’d drawn close enough for her to breathe in his woodsy, earthy, oh-so-manly cologne. She’d nearly fainted into the antiquities section. But then he’d looked at her with warm green eyes—truly looked at her—the way people rarely did, because it meant allowing the other person to truly look at them, too. Equal and opposite reactions. He made her feel like the only woman in the bookshop. Perhaps the only woman in the world. Or the universe. The moment seemed to last forever, and yet it was over much too soon. Or at least, it should have been the end. Alex resolved to scrub the encounter from her mental slate, but Penny—the incurable romantic among them—wouldn’t allow it. Since he hadn’t given his name, Penny anointed him with increasingly ridiculous titles. First he was merely the Bookshop Rake, but as the weeks wore on, he made a rapid ascent up the rungs of the peerage. Sir Read. Lord Literature. The Duke of Hatchard’s. Stop, Alex told her again and again. That was ages ago, and I haven’t thought of him since. He certainly hasn’t thought of me. It was nothing. Except that it wasn’t quite nothing. Some idiotic corner of her memory embellished the encounter with rainbows and sparkles until it resembled . . . something. Something too mortifying to ever admit aloud, even to Penny, Emma, and Nicola. In truth, Alex avoided admitting it to herself. From that day forward, whenever she visited Hatchard’s—or the Temple of Muses, or even the Minerva Library—she looked for him. Imagining that they might collide once again, and he would confess, over afternoon tea that lingered into dinner, that he’d been haunting the bookshops, too—hoping to meet with her. Because, naturally, in those two minutes of painful one-sided conversation, he’d divined that an incoherent, clumsy, working-class girl small enough to fit into the average kitchen cupboard was everything he’d always yearned to find. You’re exactly what I’ve been searching for. Now that I’ve found you, I’ll never let you go. Alex worked for her living, setting clocks in the homes of wealthy customers, and she didn’t have time for dreams. She set goals, and she worked to achieve them. Feet on the ground, shoulders squared, and head on straight. She would not—absolutely not—be carried away with romantic fantasies. Sadly, her imagination ignored this memorandum. 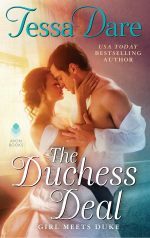 In her daydreams, the afternoon tea led to walks in the park, deep conversations, kisses under the stars, and even—Alexandra’s dignity wilted just thinking of it—a wedding. Do you take this man, Anonymous Bookshop Rake with Horrid Taste in Children’s Literature, to be your wedded husband? After months of attempting to quash this madness, Alex gave up. At least the fantasies—foolish as they might be—were hers to keep secret. No one else need ever know. In all likelihood, she would never meet with the Bookshop Rake again. Until, of course, the morning that she did. Want to read more? Chapter One is available here!